The photographs on this page are subject to original photographer’s copyright and are provided here solely to allow potential purchasers to preview select images from the collection. Downloading and copying the images is strictly prohibited and may result in liability under Title 17 of the US Code. The “Lost Disneyland Album” and the “Holy Grail of Disneyland construction” are some of the things we are hearing from Disneyland historians. It’s the Orangewood Album, our showcase piece among all of our photo collections. It has more than 615 original Disneyland construction, Hotel ground-breaking, and opening day photos preserved in a vintage album created circa 1955. 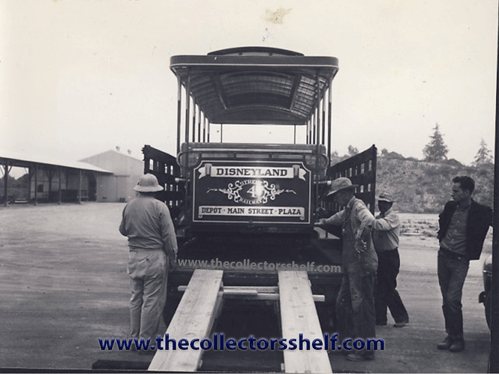 The Collector’s Shelf staff met with Disney Archives in December of 2015 to identify content of photos and discern their level of rarity. Through our research we have found that more than 80% of the photos of the album are not known to exist in any public form. 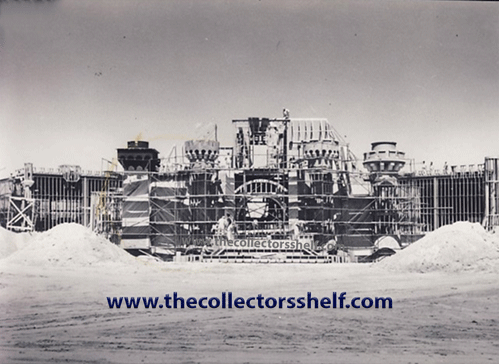 The photos that we were able to identify are among the rarest including a set from groundbreaking of the Disneyland Hotel. After first acquiring this collection, it quickly became evident that most of these photos have never been seen. These high quality original photographs were clearly put into this album for someone of importance. Perhaps it was assembled for either a senior Disney executive, a high ranking local official or one of the major sponsors. The origin of the album is at present unknown. This adds to the mystery as to who the original owner was and its purpose. The photos are clear, sharp images that document the earliest days of Disneyland, with photos of all of the major attractions during various stages of construction. Several of the photos also capture many rare images, that have never been seen. Among these images, are perhaps the largest number of photographs in existence that include C.V. Wood at Disneyland during construction. Over 30 photos in this collection, contain images of C.V. Wood, that appear not to have seen the light of day, until now. C.V. Wood is still a contentious figure today. 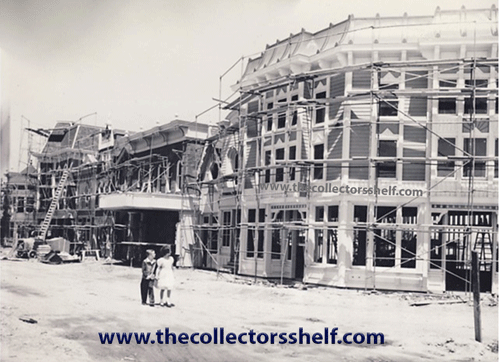 These photos may bring new light to C.V. Wood’s involvement in the construction of Disneyland and may go a long way in rewriting Disneyland’s history and C.V.’s place in that history. First known photo of children inside Disneyland (one in a series of 12 taken of the children walking throughout the park in areas of Frontierland, Fantasyland, Sleeping Beauty’s Castle, and backstage areas). 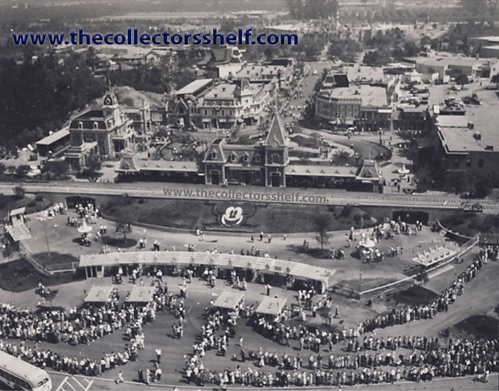 Also included are 18 images that depict the ground breaking ceremony of the Disneyland Hotel. These photos were thought to be lost to the world, until some photos were discovered in the Bonita Granville-Wrather Estate, back in 2008. Until now, those were the only known original photographs of this event and are in the possession of the Jack Wrather / Bonita Granville family. 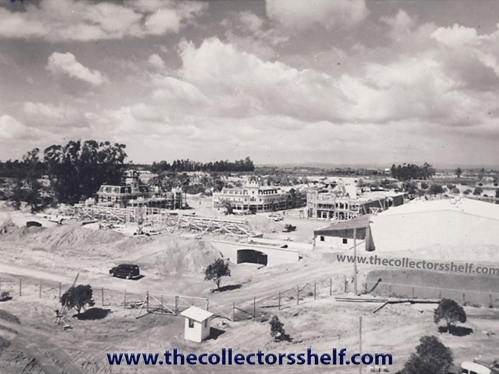 Though it should be noted that our collection actually has more photos from the groundbreaking of the Disneyland Hotel. The content is so thorough, there are even photos of Joe Fowler and Harper Goff at a nearby waterway researching water craft that would be appropriate to be used for the Jungle Cruise (thank you to the folks at Disney Archives for helping identify these images). The most compelling of the photos contained within this collection, is a series of 12 photographs of a little boy and girl, taken early during Disneyland’s construction. Disney has stated that the first kids to visit Disneyland were Sybil Stanton and Bill Krauch in June 1955, 3 weeks before opening day. The photo of the children in the Orangewood Album is dated to January 1955, a full 5 months before Sybil and Bill. Clearly, this confirms that the photos of the children in the Orangewood Album were not known to exist until now. You can see Disney’s “First Kids to Visit Disneyland” here. Imagine these two young children, holding hands with their backs to the camera, looking up at Sleeping Beauty’s Castle very early during its construction. There is scaffolding on the outside of the castle, as it is being built. One of the children is pointing up at the structure and your mind leaps to how they must have been dreaming of the promise of what was to come. Magical images. As a construction site, children would not have been allowed in during construction, so the presence of these children is truly amazing. As the earliest known photos of children at Disneyland, these images are not only historic and important, they are emotionally powerful. Even the most casual Disneyland fan will experience an emotional connection, when viewing these photos. Renie Bardeau’s “Footsteps” photo is arguably the most well known vintage photograph of Disneyland. I would guess that even Walt Disney would think that this photo of the children, captures the essence of Disneyland better than any other photo. After all, in Walt’s eyes, Disneyland was ultimately about the children. We have posted a complete description of all of the photos contained within the collection. Who doesn’t like a good mystery? For whom was this album originally created? Who are the children featured in the series of 12 photographs contained within this collection? As the first known photographs of children at Disneyland, wouldn’t it be amazing to know the identity of these children? Our research has yet to uncover the answers to these questions. Perhaps they are unknowable. But maybe there are clues contained within this collection that can still provide answers to these mysteries. Handwritten notes within the album speak of intimate details of the park, early sponsors, and visiting celebrities. The album itself contains over 615 original photographs. As previously mentioned, over 80% of the photos contained within this collection are not known to exist in any public form. The photos range in size from approximately 4 x 6 inches to 5 x 7 inches. All the photos are clear sharp images and were taken with an artist’s eye. 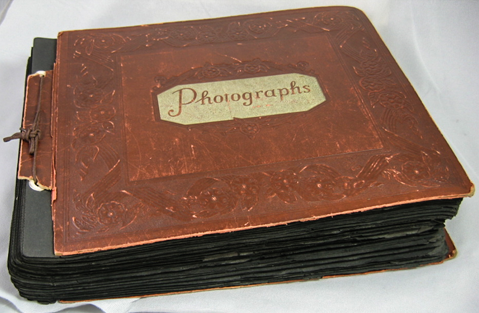 The photos are housed in a photo album typical to the late 1950s, with on average four photos per page. While researching the photos in this album, it became clear that this collection must find its way to a serious Disney collector. While the collection has been preserved as found, at some point the photos will need to be properly archived. The decision how the photos are to be shared with the Disney community will lie with the new owner. This is why you will only find a very limited number of photographs from this album contained within this page. It is difficult to put a value on a collection such as this, since nothing like this collection appears to have ever come to market. As a collector of vintage and antique photographs, I can comfortably say that each of the relatively small number of photos that we have found to exist in a public form, would conservatively be valued from several hundred dollars upwards to a thousand dollars each. The majority of photos that do not appear in a public form, would again be conservatively valued in the thousands of dollars each, as they are all original photos that do not appear to exist anywhere else, but in this collection. The most difficult photos to value are the handful of photos contained within this collection that are the most unique and therefore the most important from a historical perspective. For example, the photos of the children described above, are extremely artistic, creating an emotional connection with anyone who sees them. In addition, being the earliest known photographs of children at Disneyland, they are of historical importance. It is quite easy to imagine that these photos will become perhaps the most iconic images ever taken at Disneyland. As a comparison, arguably, the most iconic photo of Disneyland would be that of Renie Bardeau’s “Footsteps”. This is the image of Walt walking in the back of Sleeping Beauty’s Castle on an early morning one day in 1964. This image has been reproduced countless times on everything from coffee mugs to t-shirts to posters. The original is in the possession of Disney Archives. How do you put a price on such and iconic photo? I am sure Disney would not consider selling the original photo of “Footsteps” at any price. Some of the photos contained within this collection, will become as iconic as “Footsteps”. Here is your chance to own what is the most unique and historical collection of Disneyana relating to Disneyland. The most important private collection held outside of Disney Archives. 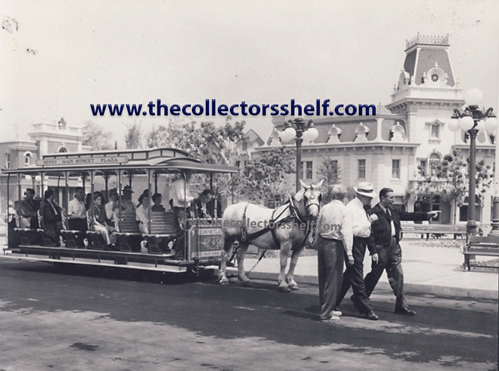 As mentioned, our intention is for this collection to find a home with a Disney collector. That person can then decide if they wish to work towards sharing these photographs with the world. If you are interested in owning this collection, contact us using the attached form here. Since it is so difficult to put a price on a unique collection such as this, we will be accepting offers on the entire collection. Viewings can be arranged for serious buyers only. All offers will be considered. © 2019 The Collector's Shelf. All rights reserved.